bl.uk > Online Gallery Home	> Online exhibitions	> Asia, Pacific and Africa Collections	> Thackeray's Monument, Dharwar. Taken by Henry Cousens in the1880s, this photograph forms part of the Archaeological Survey of India Collections (Indian Museum Series). 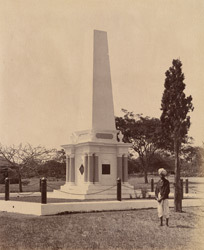 The obelisk was raised to the memory St John Thackeray, Collector and Political Agent for the Southern Mahratta Doab region, who was killed in the rebellion at Kittur in 1824.